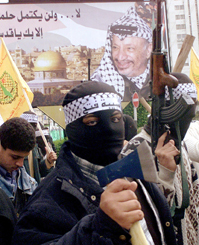 Will new flare-ups derail the peace process? Efforts to bring about peace in the Middle East may have suffered a serious setback in February when hard-line nationalist Ariel Sharon was elected prime minister of Israel. Some analysts say Sharon is more likely to crack down on the Palestinians than come to terms with them. His election also comes at a time when the new Bush administration has indicated that it will be less involved in trying to bring the parties together. But others say Sharon's get-tough approach may ultimately lead both sides back to the bargaining table. Meanwhile, Palestinian leader Yasser Arafat is being pressured to control continuing Arab violence in the occupied territories. Critics contend he is allowing the bloodshed to continue to advance his political aims, while others say his hands are tied and the Israelis are provoking the violence.